the timing and the mode of getting there will be the most important factor. 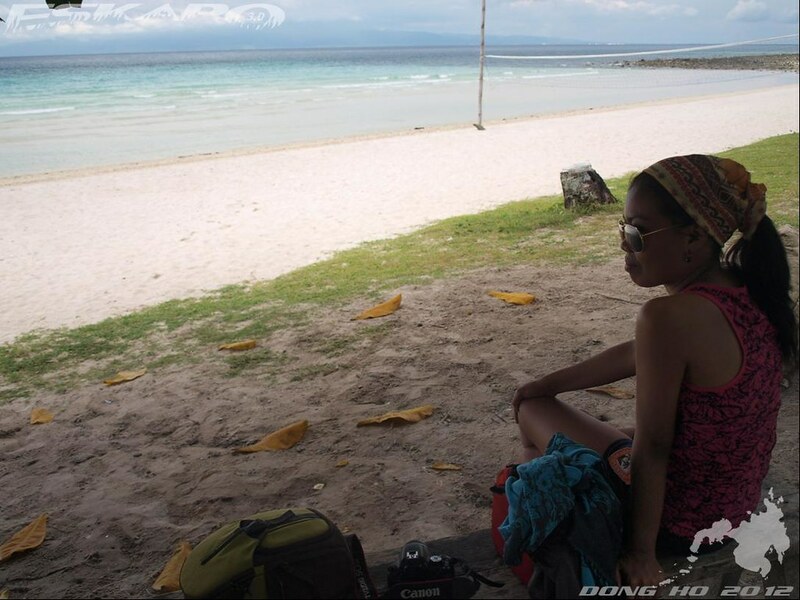 generally, tourists going to the island of Malamawi would always go there to visit White Beach. the island's nicest beach area for swimming. timing is important as this beach is totally different during weekdays and the weekend. on this particular trip, i had Chyng of No Spam No Virus No Kidding with me. since i wanted her to experience how a usual local would go there, we decided to take the public boat ride (10mins) and the habal-habal ride from the Malamawi's main port to White Beach (20-30mins). it was the best time as it was summer on a weekday. there were very few people in the area with soldiers who are regularly stationed in the area for security purpose. this was the first stop for the Eskapo Mindanao Series. a large portion of the coast of the island are white sand beaches but it's the area called White Beach that is popular to many. 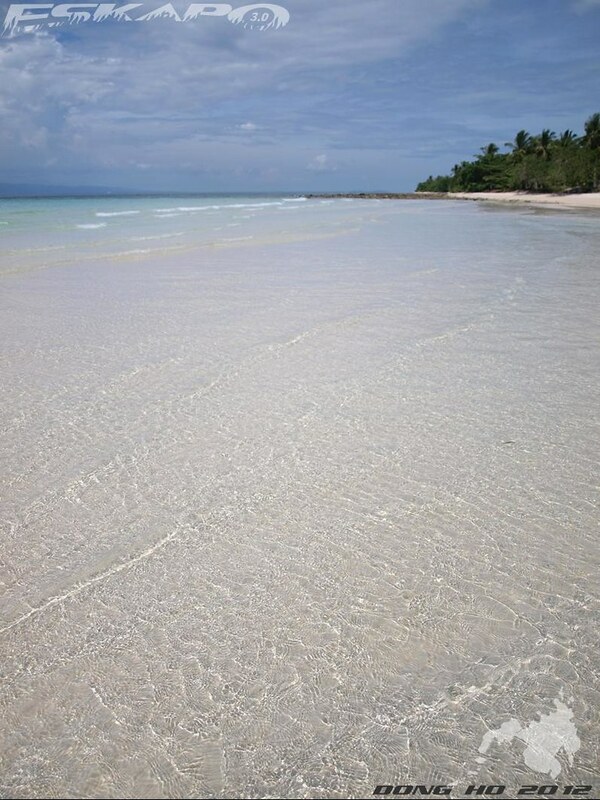 the sand in White Beach can be compared to that of Boracay, the crystal clear waters is exceptional but the expanse of an almost rock-less area for beach swimming is limited to less than a kilometer. both side of the main beach stretch is rocky. making it best for beach swimming, snorkeling and shell picking. 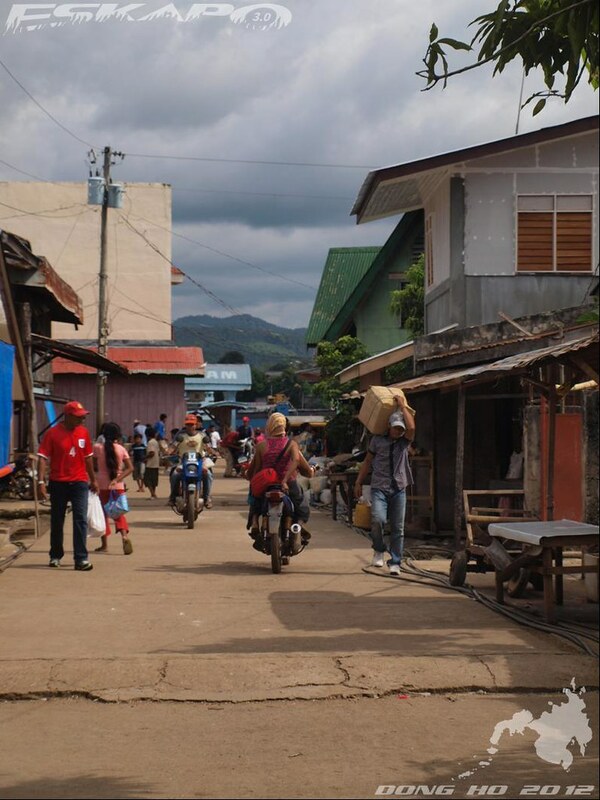 the island of Malamawi is shared by both Christians and Muslims. the coastal areas are mainly occupied by the Badjaos while mostly Christian communities are settled inland. the island has an extension of Isabela city's public school but due to accessibility some of the people in the island still prefer studying in the main island of Basilan. 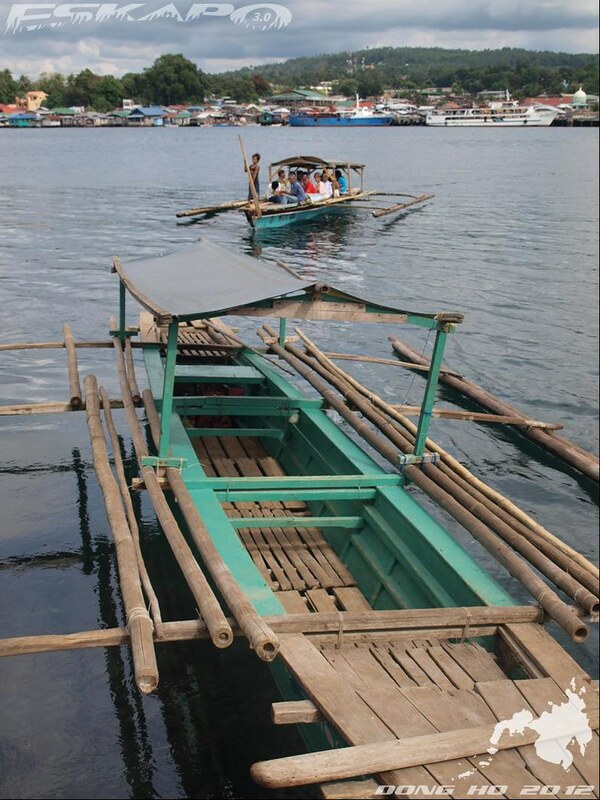 it is accessible from Isabela City by a public motor boat enough to carry 20 people crossing the Isabela channel. it travels daily the entire day as most locals would travel to the city and back everyday. length of the boat trip is 10-15minutes. 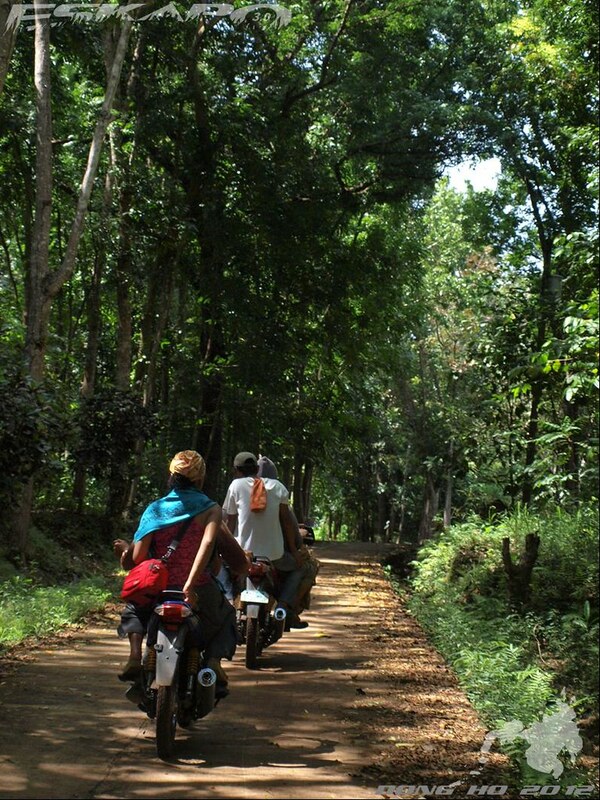 main mode of transportation within the island are motorbikes. composed of two major islands connected by a large protected mangrove swamp. one side is facing the Isabela channel where the city of Isabela is visible while the other side is the Sulu sea. a hilly portion is set on the middle of the island the rest is flat and roads are mostly unpaved. it is relatively safe to go to the island but as i would always recommend, it is better to have a local join you or best yet coordinate with the city tourism. (see contact number below). 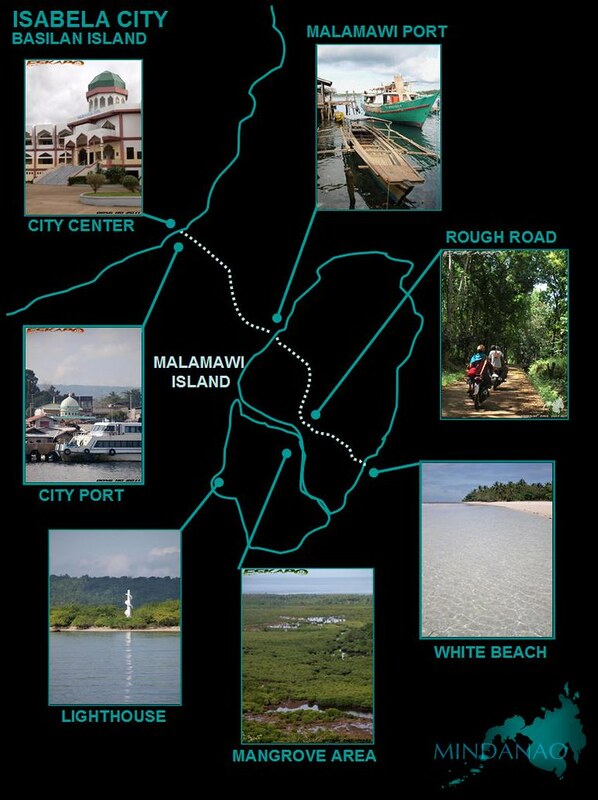 option 1: take a boat trip from Isabela city's boat dock site for Malamawi bound trips. it is just a short walk away from the main dock site of ferries coming from Zamboanga. Isabela dock site to Malamawi pier (10minutes or less). from the Malamawi pier or is locally known as Carbon pier, there are motorbike drivers who can bring you to White beach. if you've arranged in advance for a pick-up ride, they will pick you up from here for an hour or less trip to White beach. option 2: rent a boat from Isabela city pier Malamawi bound that will bring you directly to White beach. warning: this can be risky as waves are most of the time big for this route. this less recommended. it is advisable to check first the situation in the island before setting a visit. i also recommend that you know of someone from the island who can guide you around. The beach is fantastic and so are the photos! >Kulapitot, yes. magkasama kami ni Chyng on this trip. marami pa kaming pupuntahan. sana makabisita ka rin sa beach ng malamawi. >Ardee, yes. mahirap tanggihan maligo sa beach na ganito. sana makapunta ka. Ganda dyan, Dong! 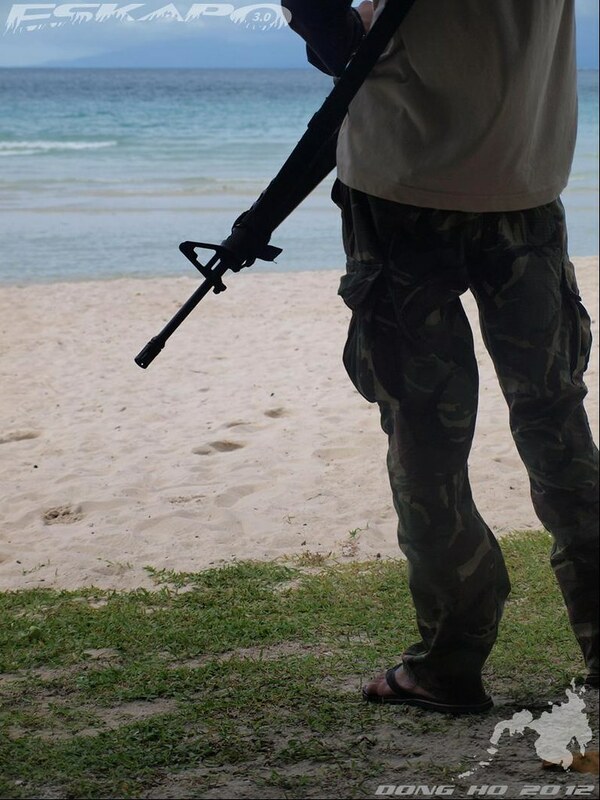 Kaso parang di ko pa kayang magenjoy sa beach habang may mga armed men na nakatambay sa paligid hehe! im so lucky narating ko to. super bragging rights! haha thanks dom! looking forward sa ating next trip! I want to go to Basilan too, as to when, I don't know, but I am indeed interested to go! si Chyng mukhang di man lang nahirapan sumakay sa likod ng motorbike with her long skirt! Wow the water is really crystal clear. But the sight of the rifle really made a city girl like me worried lol. i believe you, dom (and chyng) in saying the place is safe. however, nangiti ako sa photo na posted mo beside your text explaining security & safety; ang haba ng baril! safe nga! That water is so clear! Looks like a really beautiful place. As always and ever. Your blog is amazing. am back from my vacay, how have you been? ang swerte naman ni chyng! the beach looks really really fine! The security photo freaks me out and makes me paranoid, lol! just kidding... I like the shawl that the lady is wearing from the first photo. Great set. The unspoiled beach is so beautiful. This looks like a gorgeous island. I really appreciate the level of detail and tips section on this post. I would love to go tramping in Mindanao in the future. Nice blog. Hi sir. 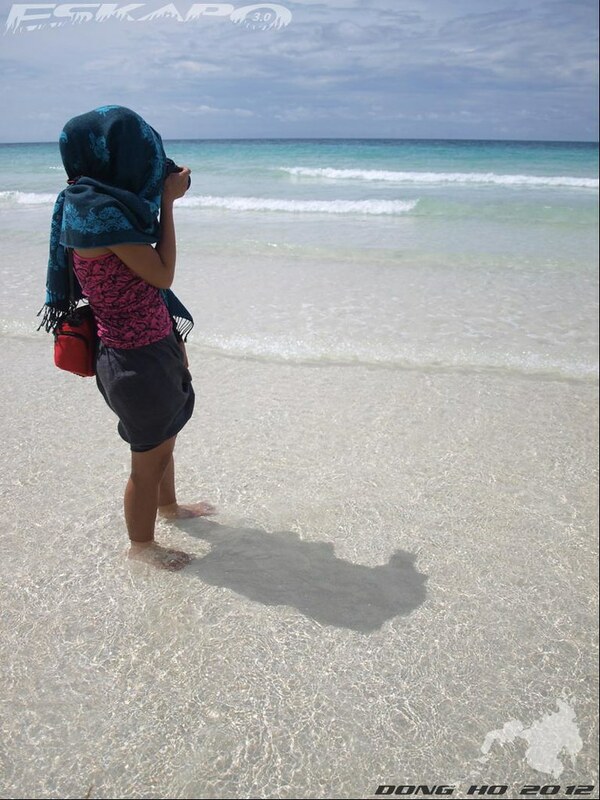 I saw in Bantog Backpackers' blog that you're their tour guide when the visited Basilan. I am planning po to visit Basilan with a friend on June 29, 2016. I would like to ask po sana if you can recommend a local tour guide to accompany us. My email is jllumbres@gmail.com. Thank you sir.